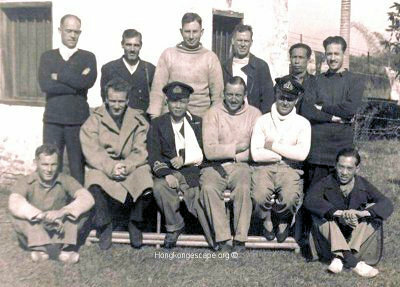 Jack worked his way up through the engineering branch and eventually took a shore based position as Superintendent of Engineering at the Taikoo Dockyard, Hong Kong. All available HKRNVR were then mobilized into Royal Navy Divisions (RND) to fight on land round the Aberdeen and Stanley areas as infantry. On 21st December JJ along with Lt T J Price accompanied Hong Kong’s chief intelligence officer Charles Boxer across open ground after they found their road blocked below Shouson Hill when Boxer took a bullet in his chest. Lt Price and Sub Lt Forster carried the wounded Boxer to the tempory navy HQ in the Industrial School in Aberderdeen where Boxer was pronounced dead on arrival. Boxer was not dead and eventually recovered enough to be noticed and was then transported to the Queen Mary Hospital. Sq-Ldr Max Oxford took over Boxer's duties for the final few days of the battle. Left: HMS Cornflower, loaned to the Hong Kong Government as an RNVR Drillship on 31/3/193. Sold in1940 and renamed Tai Hing. Repurchased in September 1940 with original name but nick-named the Cornflower II. Warrant-Officer Morley-Wright and Sub-Lt JJ Forster were working on the scuttled HMS Cornflower's 25' motor launch alongside the pier by Hope Dock, just west of Staunton creek. Alex Damsgaard, a tall Jutlander, and late Master of the Danish Cable-laying ship Store Nordisk of the Store Nordiske Telegraf-Selskab (Great Northern Telegraph Company) and his friend, Midshipman Holgar Christiansen HKDDC who had survived the bombing of the Naval Armament Tug 'Gatling when it was bombed and sanka in Aberdeen Harbour joined them along with a fifth volunteer, 2nd Engineer D Harley who had served SS Yatshing. Adm Chan Chak: "The Norwegian engineer was the first one shot dead, then the steer man. MacDougall and others were wounded. Most of the stray bullets had hit the boat and even some had hit my helmet. David MacDougall MoI: "It was then 4:45 and in a few seconds it seemed every rifle and machine gun in the Japanese army had opened fire on us. The bullets came through the flimsy wooden hull as if it were paper; and presently they opened up with artillery as well. Capt Freddie Guest BHQ: "We stared at one another with startled looks and I yelled; “My God! Sighting shots,” as indeed they were, and in the next second came the frightening rattle of a machine-gun. Their first burst was just short of the target which caused the water to splash only a few yards away, thereby giving them their range. The second burst hit the Norwegian engineer (Damsgaard), poor fellow, who fell on me riddled with bullets. It also succeeded in hitting the petrol tank which made the engine give out immediately. Click here to read the full transcript of the escape in the Cornflower launch. Along with S.K. 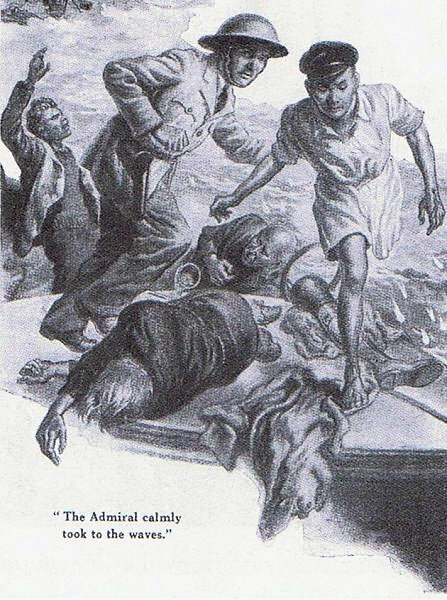 were two severely wounded volunteer crew left in the boat, the tall Jutlander Alex Damsgaard & Irishman J. J. Forster. After drifting all night the launch fetched up on the shore and S.K. bribed a junk man to take the two wounded to a hospital. Both JJ Forster and Alex Damsgaard were reported alive in "The Western Morning Star" 6th February 1942. JJ's young widow Raymonde and two young girls, Maureen aged three and Patrisha (Paddy) aged one were interned at St. Paul’s Hospital for the remainder of the Japanese occupation without knowing JJ's fate.